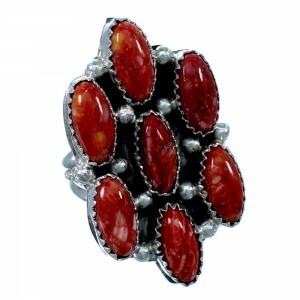 Sterling silver and real Red Oyster Shell. (Matrix in stones may vary slightly). 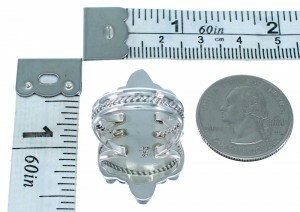 Ring is size 6-1/2, it measures approximately 1-3/8" long and 3/4" wide. Looking at such beauty tells the capabilities of Native American art! 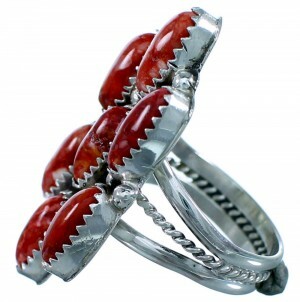 This piece of Native American jewelry is Navajo hand crafted by artist Roberta Begay, out of genuine sterling silver and real Red Oyster Shells. A total of SEVEN stones are carefully set in hand cut bezel settings while being accented by mini silver beads for a magnificent finish. 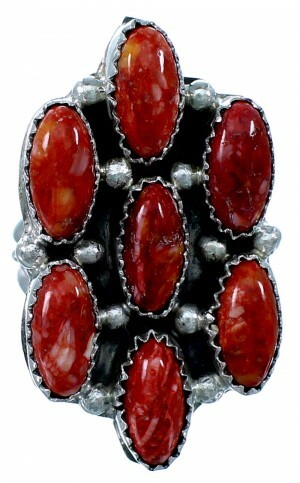 The band is highlighted by twisted silver and will make an instant style statement! The ring is stamped sterling and hallmarked.